So when I was at the thrift store and saw this frame (in all it’s ugly 1988 mauve and teal goodness) i knew it would be perfect. And since it was only $3.50, even if it didn’t work out, it was worth the risk. The first thing I did was remove the artwork and the glass (and believe it or not, you want to save this *cough* *cough* beautiful matted print.. you will need it later. Next I used spray adhesive (you also could use mod podge) to attach a piece of scrap burlap to the backer board. I wanted my fame to be rustic and a little ‘nautical’ but if you want a more polished look, like the Target inspiration, you could use a fine line or even pretty paper. I actually ended up not using the frame for photos, but for some little nautical flags which spell out “J-O-S-H” in the baby’s bedroom (I’ll have a tutorial on those soon..) but I think it is cute either way. And not a bad alternative to Target’s version, but for only $5! I know it's a bit corny to say but yours is much nicer! Thrift/Charity shops are just such a great source of frames aren't they?! 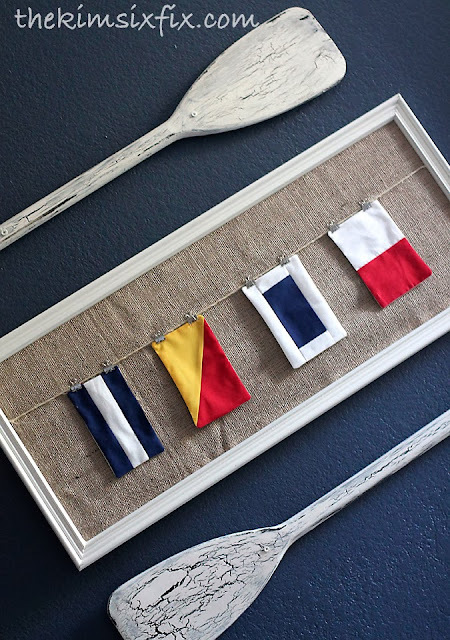 The picture gallery is a cute look, but your nautical flags rock it! What a wonderful ideas. Thanks for sharing.